BASIC PACKAGE for summer 2019 Santorini Easy Brakes. * the hotel depends on availability and is known at least 24 hours after the booking. * Price differs and depends on the arrival date and period. Aegina is a beautiful island for swimming, shopping, and recreation. The locals are extremely friendly and helpful, and almost every merchant speaks excellent English. Aegina is worth at least a day of your itinerary, and you may find yourself staying overnight. Tradition derives its name from Aegina, the mother of the hero Aeacus. Aeacus was born on the island and became its king. During ancient times Aegina was a rival of Athens, the great sea power of the era. There is nothing like a day trip to one of the nearby Saronic islands. Visit Aegina, capital of Greece (1827-1829), on a day trip from Piraeus. Take the morning ferry from Piraeus and in 1h 20m. arrive in Aegina. The church of Agios Nikolaos, at the port of the island, welcomes you. The beautiful neoclassical buildings remind you of the glory of the island. There are regular bus services from Aegina town to destinations throughout the island. Agia Marina and Perdika are easily reached by public bus. Proved by findings in the Column area, dating from 3000 BC. 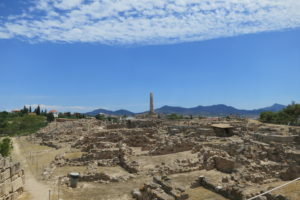 Aegina was inhabited since the Neolithic time. 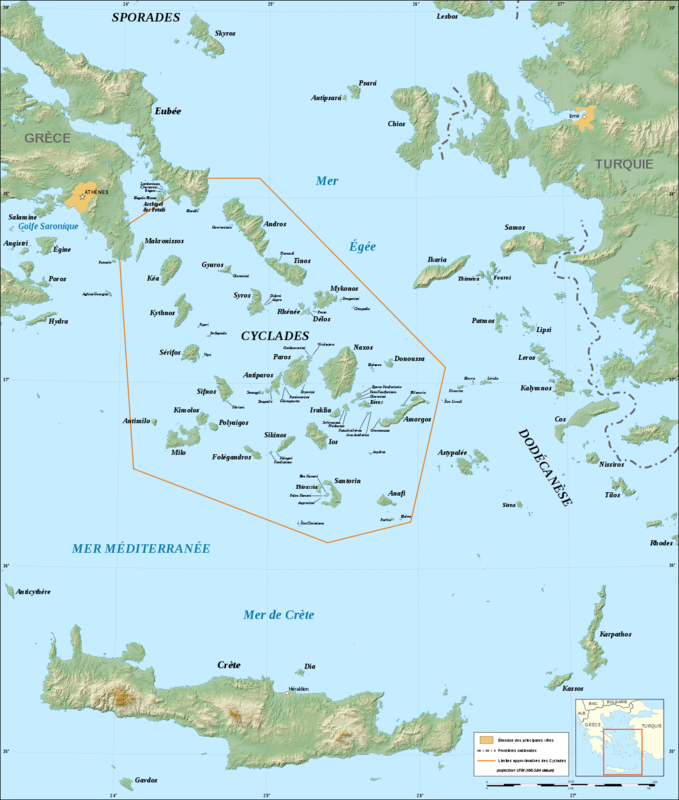 Later Minoans came to the island, then – Achaeans and Dorians. 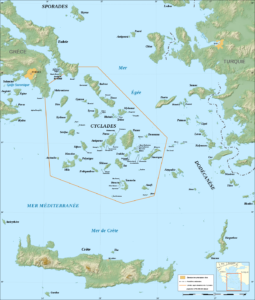 From the middle of the 1st c. BC Aegina developed rush trade and at the same time declares itself as a powerful maritime state. The peak of blossom comes in 6th c. BC, when Aegina, being independent, became the first city-state, and began to mint coins. Despite the concurrence with Athens and Piraeus, Aegina became confederate of Athens in the Salamis battle. However Athenians (who never really trusted Aegina) took over the island in the 5th c. BC. The latest history of the island does not stand out from the history of the rest of Greece. The participation of the island in the liberation war against the Turks in 1821 was of major importance, because Aegina was the first seat of the first government of independent Greece led by Kapodistrias. Sightseeings in the town: the Archeological museum, the Column (close to the port area) which is actually the only remnant of the Temple of Apollo, the cathedral, in which the first Greek government swore. You can take a tour to the famous temple of Goddess Aphaea, the patroness of the island, located 11 km from the town. A doric temple, built after the battle of Salamis, in 480 BC. 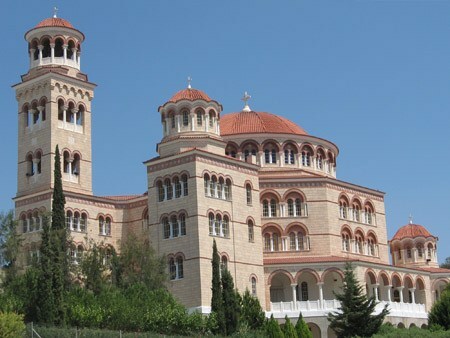 Another tour is to the monastery of St.Nektarios. The new built temple of the monastery is one of the best samples of the neo-byzantine architecture in Greece. The monastery of St.Nektarios is located on a hill not far from the port of island. Here, in a little church, is preserved the st. Chapter of Prelate. You visit the cell, where he was praying during the last years of his life and drink healing water from the holy fountain. 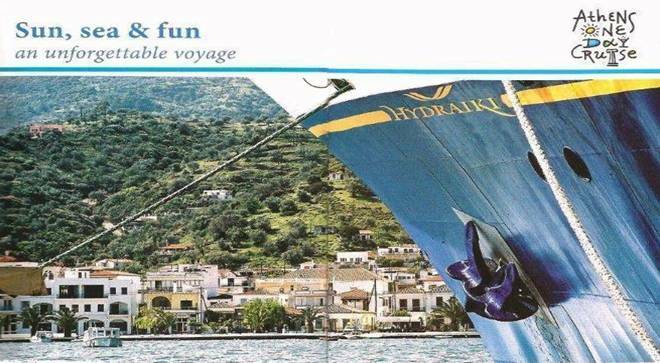 For bookings and information on Aegina hotels, car rentals and ferry tickets contact Astoria Travel in Athens. Boats go back and forth all day long to Aegina Town. The first boat leaves Pireaus at 7:00 am and the last at 18:30. The last boat leaves from Aegina at 19:00 or 20:00. The Flying Dolphin takes 40 minutes and is a lot less comfortable so go with for the ferry. The trip takes 1h 15 min. An hour ferry trip is just about perfect and the waters are usually calm. Visit the Archaeological Site of Kolona. The Church of Agios Nektarios (named after its patron). St Nektarius, died in 1920 and was canonized in 1961. His memory is celebrated on 9 November. You may have lunch in a taverna at the port, swim in a nice sandy beach and in the afternoon board the ferry back to Piraeus. Aegina Ferry Boat Get the ferry from Piraeus to the main town in Aegina. You can sit in the lounge or choose to sit at the top deck watching the ferry pass by the cruise ships in the harbor and then the tankers and freighters anchored outside the harbor. In 30 minutes we were close enough to see the houses on Aegina and the scenery became more interesting. Aegina is only about an hour and fifteen minutes from Pireaus on a regular ferry and half that on a flying dolphin hydrofoil so there is hardly enough time to get bored on the boat. Aegina, Greece The island of Aegina is really surprising. The town is quite traditional and while tourism is in evidence it is still largely Greeks who come here for the day or even for their summer holidays. Most of the restaurants in the back streets cater for Greek clientele and serve food that Greek people love, and the adventurous tourists would be likely to try. There is a great covered fish market in town, and there are several small traditional restaurants that are in and around it. The port of Aegina is a busy one with ferries, flying dolphins, cruise ships, catamarans and fishing boats sailing in and out, depositing people, cars and fish. Aegina is known for the small ouzeries and fish mezedes and there are a number of these places on the waterfront and on the back streets, easily recognizable by the small grills and the octopus cooking on them. Athenians come here to escape the city, drink ouzo, eat seafood and watch the fishing boats. When you arrive, the first thing that you see is the line of horse-drawn carriages. I can’t think of a good enough reason to not take a little spin around the port and get a feel for the place. It is great fun to sit in front with the driver. Ancient ruins of Aegina and temple of Apollo with Aegina town in the background As you face the village and walk to your left there is a row of seafood restaurants along the waterfront, all with signs saying the special of the day is sea-urchin salad and each with a grill loaded with octopus. We continue to walk past the first beach and the small boatyard towards the area known as Koloni, named for the lone column that remains from the ancient temple of Apollo that stood on this site on a small hill overlooking the port. 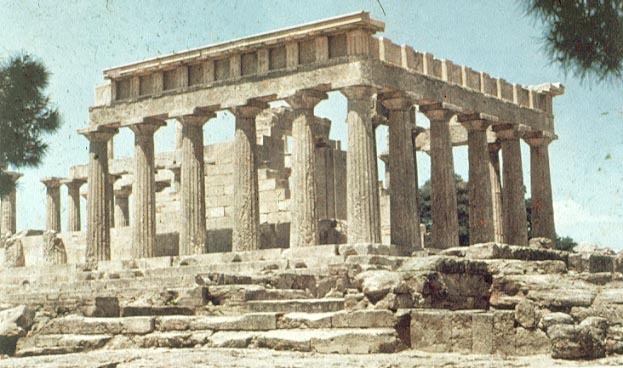 Aegina was a major power in the classical Greek times and for a period Athens main competitor. There is a small museum on the site that we went through in about 4 minutes, though someone with a deeper interest in antiquities than my daughter and I might be able to spend a longer time examining the ancient pottery that has been found in the area. The archaeological site itself is fairly impressive and the view from the temple of the ferries coming and going from the port makes it a good spot to visit even if you have no interest in ancient Aegina. Aegina town beach But it was from here that Amarandi spotted the beautiful beach on the far side and could not help but notice that there were indeed people swimming, and once she had made up her mind there was no way I could deter her. I tried telling her that these people were a local chapter of the Polar Bear Club and this early spring swim was a painful rite of passage and that they were most likely suffering severely. But this did not convince her and so we trudged back into town to find a shop that sold bathing suits and towels since we were completely unprepared. After walking all the way through the back streets of the town and stopping in several shops with no success, we ended up on the opposite side near the cathedral. I took the opportunity of calling Andrea on my Greece-Travel Phone with the hopes that she could convince Amarandi that swimming was a foolhardy idea or even just putting her foot down and not permitting me to let her go swimming, enabling me to remain the ‘good guy’ for awhile. But when we told her our plan she thought that was a great idea, since she was in Athens and it was a couple degrees hotter there and she probably wished she could jump in the sea too. Aegina Port We walked back along the dock, all the while Amarandi keeping her eyes open for a shop that might sell bathing suits and me trying to distract her by showing her things of interest. We stopped at the boats that sell vegetables and Amarandi wanted to go on board but was reluctant to walk up the gangplank. So was I but not because I was afraid, but because I suddenly realized that the sun had been shining on my head for a couple hours and I needed a hat badly. Chances are that the same place that sold the bathing suits would also sell hats, so I joined Amarandi in the search. Finally on one of the pedestrian market streets we found the store with postcards, t-shirts and they said bathing suits. Amarandi went with the girl to try some on while I tried on the only pair in the store that would possibly fit me since it really was too early for people to be buying bathing suits and their supplies were low. I also bought a baseball cap that said ‘Hellas’ on it that Andrea made me give away as soon as she saw it because it made me look like a tourist. (She said I could wear it in the states if I wanted to.) I also had to buy a large towel to dry off with after we came out of the freezing Aegean and of course a gym bag to carry the wet bathing suits and towels back to Athens. Amarandi found a bathing suit she liked and we paid the bill. This little swim was costing us $75. Port of Aegina We made our way back along the quay and through the trees to the beach only to find that the Polar Bear Club had gone home to take hot showers and restore their circulation. Amarandi took off her pants to reveal that she had put her bathing suit on over her underwear. I had to explain that this was not the clear-thinking I had been trying to impart to her when I took the vow of parenthood. Why didn’t she remove the underwear when she was in the dressing room? She did not know the answer to this question but it gave me the opportunity to teach her the technique of changing clothes while wrapped in a towel, which all Greek women are adept at. She mastered it quickly and ran into the sea up to her ankles before stopping and standing there waiting for me to make the next move. I stepped in and it felt OK, as water two inches deep that has been warmed by the sun all day would. But when I dived into the deeper water I had a near heart attack and it was all I could do to stay in the sea until I felt I had gotten my seventy-five dollars worth that I had spent on the equipment that had enabled me to take this swim. Aegina restaurants After a refreshing swim you are ready for the next adventure of the day which was lunch. Find a seaside taverna that had more Greeks than empty seats and foreigners and sit down. Try the Sea-urchin salad, grilled Octopus, fried squid, a Greek horiatiki salata even though the tomatoes were not really in season and a plate of marides or anchovies, the small fried fish that you can eat the whole fish and try the ouzo with them since they go so well together. Agia Marina, Aegina After lunch check the boat schedules. It’s not a problem getting back to Piraeus. There are ferries or flying dolphins at least every hour. You have the time to visit by a local taxi the beach village of Agia Marina. There are boats leaving to Piraeus from Agia Marina, too. The interior of the island is largely agricultural and mountainous with a couple villages along the way and the temple of Hephaestus crowning a hill near Aegina town. Agia Marina would actually be a great place to stay if you wanted to see Athens and not stay in the city. The high-speed takes less than a half hour to Pireaus and even the slower boat only takes an hour. There are a number of tavernas, a decent beach and what looked like great swimming off the rocks too. Perdika, Aegina The fishing village of Perdika is another popular day visit place for Athenians and is full of nice fish tavernas with prices more geared to Athenians than to tourists since most Greeks have a pretty good idea about what fresh fish looks like and how much it should cost. Perdika is also a popular stop for people on sailing boats and yachts and has a small but nice beach nearby. Aegina Town Beach The beaches around the island are not great, but pretty good. In my opinion the best swimming is off the rocks beneath the pines on the outskirts of both Agia Marina and Aegina town. A local resident could tell you a dozen other places to swim. If you stay awhile and you are tired of the beaches of Aegina you are just a 15 minute boat ride from the island of Agkistri. 1 km from Aegina Town, there is a Water Park, a kid’s paradise. The water slides range from the “Kamikaze”, for the more daring riders, to the gentler “Twister” for the not so daring ones. There are a couple bars by the pools for parents who need to overcome the stress of watching their child go down a 50 foot water slide a hundred and fifty times in a row. Your kids will be happy at one of the beaches, and if you go to the more popular ones, like the sandy beach at Agia Marina, the Aegina town beach, or anywhere with sun beds and umbrellas, your kids will be able to find plenty of other kids to play with provided you are there in the summer. Aegina Restaurants Aegina has several great restaurants and some live music clubs and a number of good bars. Kappos Etsi is located right behind the cafes in the port. Dimitris is from Aegina and when he graduated from Le Monde Culinary Arts School of Athens he returned to the island to open his restaurant. Combining traditional Greek dishes with his own culinary innovation and using only fresh natural ingredients, this is the type of restaurant you might find in the most cosmopolitan Greek island or European city. The Plaza serves seafood and meat dishes right on the sea between the port and the town beach. My suggestion is to try any of the restaurants close to the market on P. Irioti Street which is the next street up from the port. You can take your pick of seafood restaurants in Perdika though Remezzo’s seems to get high reviews from everyone. I had a meal at Saronis which was just fine. In Agia Marina try the popular Thymari, which has been open for almost 30 years and has attraction a legion of followers who come to the resort town every summer and eat there regularly. As for bars and cafes there are too many to even bother writing about. Just wander around until you fond one that has comfortable chairs and music you can bare. Panta Pei has live rembetika music on weekends as do several other places in Aegina town and unlike most islands there is some nightlife even in the off-season. In the summer there are discos and plenty of action at the beach bars. Temple of Apheae Be sure to visit the Temple of Aphaia located on top of a mountain on the way to Agia Marina. Besides having a spectacular view and one of the most interesting little cafes below it, the temple is a very well preserved example of the Doric style and is the most important archaeological site in the Saronic islands and one of the most important in Greece. It was built in 480 BC when Aegina was at the height of its power and from it you can see the mainland from Athens all the way to Cape Sounion. You can get there by bus or taxi from Aegina town. The site is open every day except Monday. Opening hours: Tuesday to Sunday 8:00 – 18.30. Be sure to check out the furniture in the cafe too, made from ancient columns and stones from the temple. Paleohora Aegina is another place of interest are the ruins of Paleohora east of Aegina town. This was the capital of the island from the 9th til the 18th century when villages were located inland to be safe from pirates. Aegina was one of the unlucky towns because it was destroyed once by the pirate Barbarossa in 1537 and all the inhabitants were taken away as slaves. All that remains are a number of small churches in various states of restoration but it is an amazing place and well worth the visit. You can also stop at the Monastery of Agiou Nektarou with the enormous new church built recently. 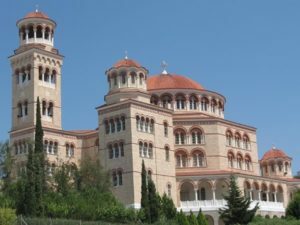 The monastery has the remains of Anastasios Kefalas, a hermit monk who died in 1920 and was the first orthodox saint of the 20th Century, canonized in 1961. The island of Aegina is famous for its pistachios which some people believe are the best in the world. You can decide for yourself. They are sold in small shops and booths in town including at the Aegina Pistachio Cooperative stand right on the dock next to where you buy your tickets for the ferry boat. In fact I would suggest buying yourself a couple bags at least because you will eat one on the boat and then you will wish you had more to bring back home with you so you can show your friends how good pistachios can be. Or you can pick up the family-size bag. Aegina is also known as the place where Nikos Kazantzakis wrote Zorba the Greek and any Zorba-file should make a journey to the island for that reason alone. Taxis and buses can take you all over the island. Before you go be sure to drop a donation into the box for FAZA: The Friends of the Strays of Aegina and Angistri. This organization feeds all the stray dogs and cats and they have a little stand on the dock where not only can you donate your stray Euros but the stray dogs of the island can feed themselves. Aegina TownIn Aegina town the most highly regarded hotels by travelers are the Hotel Rastoni, the Electra Pension and the Fistikies Holiday Apartments, all within walking distance of beaches, shops and the waterfront. If you want to be able to walk out the door and jump right into the sea then stay at the Hotel Klonos or the Danae Hotel right next door. The resort village of Agia Marina is less than half an hour from Pireaus by Flying Dolphin but the boat only goes in the summer. That means you can stay there and be on the Acropolis in an hour. Check out the Hotel Karyatides and the Rachel Hotel which are both highly rated by travelers or Hotel Panorama, which is right on the sea as is the Argo Hotel. For more hotels in Aegina also check Booking.com’s Aegina Pages. One of the best ways to see Aegina is to stay in Agistri at the popular Agistri Club Hotel. 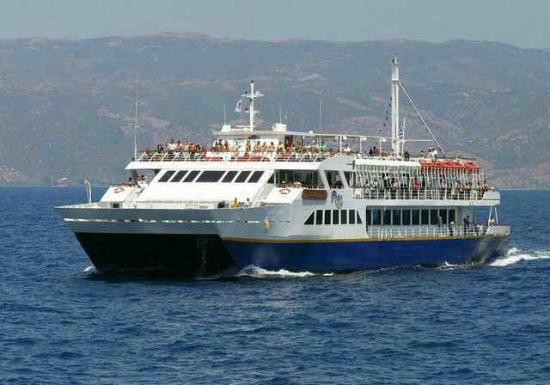 Aegina is also included in the one-day Cruise from Athens that goes almost every day of the year. You can combine Aegina with the islands of Angistri, Poros, Hydra and Spetses as well as Nafplion and The Argolis.